Have you ever noticed how people who like Hitchiker’s Guide to the Galaxy are more likely to enjoy Doctor Who, Sherlock, Neil Gaiman and Terry Pratchett? This is intuitive humour at its finest. Intuitive MBTI types tend to enjoy wordplay related sarcasm, deadpan and hyperbole, especially NT types. The differences between Extraverted Intuitive (Ne) and Introverted Intuitive (Ni) humour are subtle, but I’m going to attempt to dispel those differences. Just by way of clarification, when I use the terms Ni-user or Ne-user in this post, I’m referring to people who use them as one of their two upper cognitive functions –not just anyone who uses them. Furthermore, most of this discussion will focus around the humour of NT types, rather than NF types (though I will speak briefly about that at the end). The most direct difference is that, Ne humour is more obvious and out in the open than Ni humour. In other words, if an Ne-user makes a joke, everyone is more likely to get it, whereas if an Ni-user makes a joke, it’s usually very subtle and often requires a lot of back-knowledge. My room-mate is an ENTP and I’m an INTJ. We both have a sarcastic and rather morbid sense of humour. However, nobody actually thinks that my room-mate might kill them, while I’ve gotten plenty of comments about how people fear I’m going to kill them in their sleep. When she uses sarcasm, she changes her facial expression and voice (subconsciously) to let people know that she’s joking (TiFe). I on the other hand do not (TeFi). All my jokes are told with a completely straight face, so the majority of people don’t always realize that I’m joking when this happens. ME: Don’t concern yourself. She’ll be back from hell in a couple days when her period is over. It’s reached the point where people who know me well just ask me whenever they’re not sure whether I’m joking or not. Oft times, people assume I’m being serious when in fact, I’m being sarcastic, and that I’m being sarcastic when I am being serious. 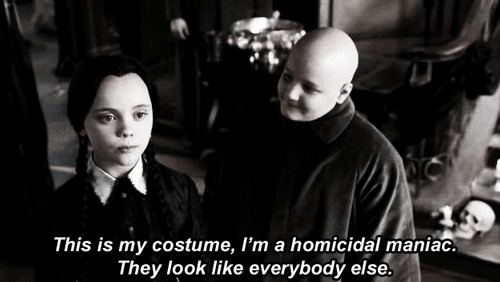 But it all boils down to the reality that I tell jokes in the same way that Wednesday Adams tells them. If we were to analyze the variations between ENTP and INTJ humour in writing, the best comparison I can think of off the top of my head is Douglas Adams (ENTP) vs Flannery O’Connor (INTJ). Douglas Adams has an intuitive humour, but he writes so that it’s more bluntly obvious that he’s telling a joke than Flannery O’Connor does. With Douglas Adams writing, you can see the ENTP humour in each individual line. Flannery O’Connor’s INTJ humour on the other hand, exists behind the words. If you were to pick any random line from the story, you probably wouldn’t find it funny. Her humour exists in making fun of society’s paradoxes in a subtle, morbid way that isn’t always noticeable unless you share her sense of humour. If you don’t share her sense of humour, you have to pay closer attention to get the joke. So, I suppose you might say Ne humour is equally sarcastic, but far less sardonic than Ni humour. If you look at Hamlet, you’ll notice that he’s a prime example of Ni-humour. He does tons of wordplay and symbolism, makes fun of everyone in ways that they can’t catch on to (because it requires back-knowledge) and doesn’t necessarily change his behavior to let you know he’s joking. He also has a very dark sense of humour. Observe the epitome of Ni humour in the following video (watch from 2:54 to 5:00 and then you can skip to watch from 5:45 to 7:50). In general, I find that INTJs are much funnier when they’re angry. I’ve never yelled at anyone in an argument, but I have killed their side with sarcasm. The mean side of our wit really comes out when we feel we’ve been wronged. Sherlock is another great example of Ni humour if you pay attention to how he insults people (that’s him being funny). 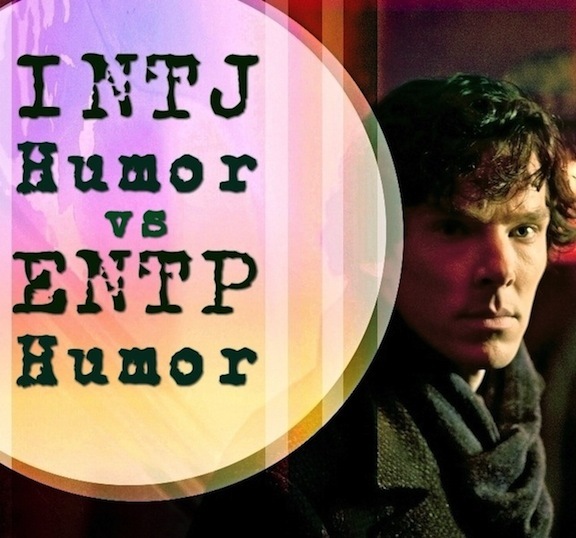 Another major difference between INTJ humour and xNTP humour is that while xNTP humour tends to contain a large number of non-sequiters, INTJ humour is typically avoids non-sequiters and aims more towards cause and effect, or direct logical chains. An ENTP is more likely to have made up the “Why did the chicken cross the road” joke, whereas, the INTJ is going to be the person who comes up with a great answer to it. Often times, INTJs will make fun of other people’s non-sequiters, or arguments they we see as non-sequiters. For instance, in the realm of philosophy, I tend to make fun of most empiricists, especially if they don’t know what they’re talking about. ME: I’ve never seen a piranha, so they must not exist. PERSON: But there are pictures of piranhas online. ME: There are pictures of God online too. 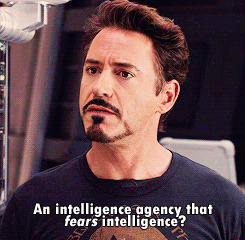 If you want an example of xNTJ humour in the extraverted domain (ENTJ), watch all the Iron Man movies. The difference between INTJ humour and ENTJ humour is that ENTJ humour tends to require less back-knowledge. It’s more accessible to everyone because it doesn’t have a secret explanation behind it that only a select group of people will get. The reason for this is that ENTJs typically have more motivation to want people to understand their jokes. They want to be funny, whereas INTJs want to use their jokes to weed out people who aren’t intelligent enough to “get” them. NF humour tends to be nicer than NT humour (mostly the F talking), although I have noticed an exception to that rule when it comes to xNFs who spend a lot of time around xNTJs. 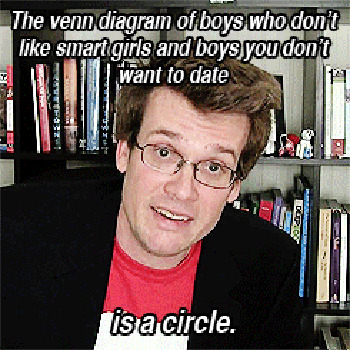 A good example of typical INFP humour in real life would be our lovely John Green. That is…on his vlog, less so in his books. For a good example of INTP humour in writing, consult the exemplary Neil Gaiman. xNFJs fall under the “kindest” category of N humour. They can usually “get” other intuitive-type’s jokes, but don’t always catch on to NT jokes quite as fast and cannot tell them. If you need more examples of N-type humour comparisons, just watch Doctor Who. You get a wide range of different N-humour. You will also notice some slight fluctuations depending on who wrote what episode (for instance, Neil Gaiman’s episodes have a lot of INFP humour in them even though the Doctor at that point is an ENTP). My ESTJ father and brother can’t tell jokes to save their lives. You don’t know pain until you have heard my father torture a joke to death and the polite laugh that follows. No one has ever expressed fear that I will kill them in there sleep or anything like that, but I force myself to act more “normal” around most people, so I don’t reveal my darker side to most people unless I choose to. However, I recently was feeling tired and down during a class, and I let my guard down on my macabre humor. And got asked “what is wrong with you?” or told something to that effect multiple times. And I have to admit: I enjoyed it. What is it about freaking people out that is so fun? I’ve been trying to figure that out for years. I think part of it has to do with the fact that you know how absolutely unserious you’re being, and there’s an engrained irony in the reality that the people you’re talking to don’t recognize that you’re joking. For me, it’s partially that irony that makes it enjoyable, but then, not everyone sees irony in practically everything. Hmm… I don’t agree with INFJs not having a sarcastic (or even sardonic) sense of humour. I’m an INFJ myself, and based on my own sense of humour and other INFJs I know, I would say we can tend to have an extremely cynical sense of humour which is aimed at making fun of society / people / stupidity. I think probably the main difference is that INFJs don’t direct their humour at a particular person, but only at people / society generally. We can also make sarcastic or sardonic jokes that are actually directed at ourselves (i.e. making fun of ourselves). It really depends on the INFJ in question. My INFJ room mate is very sarcastic, but it wasn’t quite so prominent in his sense of humour prior to spending a lot of time around me. I definitely agree with everything you’re saying though. As an INFJ myself I believe that the reason it took your room mate a decent amount of time for that portion of their humor to surface is because of mainly two things. One being that we simply are bad at quickly trusting people/being comfortable around people except in rare instances–thus we can be secretive about ourselves–and the other reason is that as Fe users we are more aware of how our sarcastic nature can offend so we are cautious when using it until we know you will not be offended. Once we feel free to let our sarcastic nature run wild, we can be quite dry of wit. Granted I grew up being very close to my INTJ mother so it may be that my levels of sarcasm arose in the presence of her immense genius, however, despite this I do believe that I have a natural flare at being sharp, caustic, blunt, and subtle. Engage. Same here. I can be pretty sarcastic too, but only with people I know won’t be offended by it–like my INTJ sister. Yes, I think there’s definitely something to that. I distinctly recall a few occasions from when I was much younger that relate to this. On one particular occasion, I interrupted a loud group conversation with a bitingly sarcastic comment. This elicited an immediate hush from those around me, and with every head in the room turned toward me in surprise, I grew incredibly uncomfortable and decided that snarky comments in public were perhaps not the best option. On the other hand, when I was stuck in an Ni-Ti loop a few years later, sardonicism laced my entire approach to interaction and whenever I joked, I was quickly labeled by some as an incredibly antisocial cynic. In some ways this was true; I rather enjoyed seeing who would and would not understand my Ni humor. Since exiting that Ni-Ti loop, I’ve found that I can easily adapt to the humor of those around me — for the sake of harmony — and maintain a constant sarcastic inner monologue. Without a doubt, however, I have the most fun with humor around the people I trust will understand it (namely my Ni-dominant friends). Which types, have you observed, are highly likely to coin funny nicknames? I really enjoy how you involve Doctor Who into your posts, it makes it more relatable and ,for me, easier to understand. I’m not sure whether I’m INFJ or INTJ because I’ve gotten different results and I relate to both but I believe my humor is more towards INTP. I really liked your post! My dad (INTJ) usually tells jokes that are sarcastic and require background knowledge. However, he does make a lot of ENTP style jokes after reading The Hitchikers Guide to the Galaxy ten times. His humor is not particularly dark, but I think he tells ENTP style jokes in public because more people are likely to understand them. I love ENTP humour, but I can’t pull it off in my own jokes unless I’m writing and deliberately in the mood. Usually I just tell jokes so that I can laugh at them in my head even if nobody else gets them. I would imagine that the main key to understanding INTJ jokes is background knowledge. My dad was the person who introduced me to humor in general so I do understand certain types of Intuitive jokes. I get the joke if given time to process it in my mind. What if you’re an INTJ but not sarcastic? I don’t take myself or anyone around me very seriously, but I also dislike being rude (conflict is inconvenient and mildly to moderately uncomfortable). 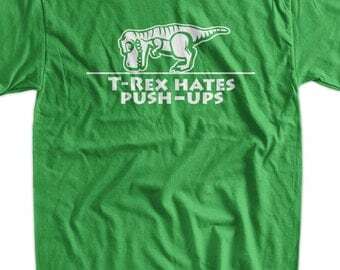 So my go-to is usually terrible puns–inoffensive and, to me, hilarious because of how obvious and unnecessary they are. I’ve never actually met an INTJ who wasn’t at least slightly sarcastic myself, but I’m not going to insist that it’s impossible because MBTI is merely a theory. Many xSTJs aren’t sarcastic and have a difficult understanding sarcasm, but that doesn’t mean there aren’t some xSTJs who are extremely sarcastic. I don’t see why the same couldn’t be true of xNTJs. I find that usually INFJs enjoy puns more than INTJs, though I certainly enjoy them to a certain extent myself. I’ve known two INTJs who never seemed to get sarcastic–in public, anyway. One of them (who didn’t normally tell jokes in person) could get into mock-serious discussions of Tolkien trivia on Facebook, but that was about as sarcastic as I saw him get. My guess is that a strong Fi belief in the importance of kindness was why those particular INTJs toned it down. Both of them seemed to show a lot more concern for other people than the stereotypes would suggest. Makes sense. Although “kindness” can be widely interpreted depending on the INTJ in question. I’m very concerned about people, but not everyone. Also, when I say “sarcasm” I’m not merely referring to sardonic sarcasm, but also to irony –which isn’t always as offensive as you’re probably thinking. Im a rude sarcastic INFP who absolutely loves “INTJ ” humour. Its just this guys perspective which is pretty accurate, but variances are bound to happen. Did u mean to say in the last paragraph that the Neil Gaimen episodes have a lot of “INTP” humor? Since he is an INTP I’m assuming that would make sense, or does he emulate other types humor styles? Have you ever been serious in conversation but those you are speaking with think that what you’ve said is a joke? I have this happen to me often and I can only attribute it to the fact that while what I said may have been serious and with flat expression but could have been considered unkind/ blunt, the crowd considers my comment too “mean” to be not a joke. Though, I did not intend for my statement to be inappropriate or mean. This happens to me all the time – both ways actually. I say serious things and people think I’m joking, or I tell a joke and people think I’m serious. Either way, it lets me know whose sense of humour is sophisticated enough to keep around. I suppose it’s better when people take blunt, but truthful statements as a joke rather than getting offended. At least that way nobody’s out to kill me for having an independent mind. Most ENFPs fail to get my jokes too. The difference between NiTe humour and NeFi humour is quite large, even if they do have their similarities. The rare xNFPs who do get my jokes are either fairly clever and have spent enough time around me to tune in when I’m being sarcastic or they’ve been through a lot of crap in their lives and so they’ve developed an insane level of sarcasm themselves. But even then, they still don’t get the majority of my jokes. I’ve thought more on this subject since I wrote this post and I’ve noticed that in addition to revolving around a vast library of back-knowldge, INTJ humour frequently also requires that you understand the entire NiTe framework from which we view the world. For instance, something will be funny to me because I notice a connection between two highly complex patterns in the world, but I won’t be able to explain the joke to anyone who can’t see those patterns (because they’re not an Ni-dominant). I have an ISTJ brother that’s about 6 years younger than me, and most of the time, he and I could share demented jokes together while my ENFP sister walks out of the room. I can relate to your experiences regarding people not getting your jokes/confusing your seriousness and sarcasm with each other. It happened to me, too, a lot of times. It isn’t uncommon that someone starts laughing when I’m being serious, and people blinking at me in confusion when I use sarcasm. (I also opt to keep a straight face.) My class was filled with Sensors and the only other Intuitive in my class was my ENFP friend, but he sometimes failed to get my jokes, too, because he didn’t have the required back-knowledge.